deemed the ImageLair Web site worthy of these Awards. Award graphics without links means: web site is not online. You have won the prestigious "World Best Websites Award". proudly, it is an extremely tough one to earn. the Internet. Keep up the fantastic work ! ! ! I found an amazing site.....a top level contribution to arts and to the web community. It's a very rare combination on the World Wide Web. It's evident that you have put a lot of hard work into it and your effort and dedication shine throughout your pages. Only three out of ten sites win this web award, so you belong to a very small group of outstanding web artists. This "Creativity Award" is presented to ImageLair. information in this site. You have done a great job. 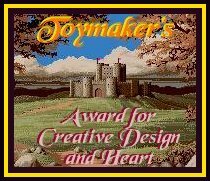 You have been awarded the "Toymaker Award". for Heart and Creative Design. "Golden Sea Award for Web Excellence". presentation of your site and offer you my "Gold Award". make the Web a fascinating and informative playground. "The Peoples Pick" for the week ending May 2, 1999.